In this review and reuse of its past, the important third album returns to its roots and proudly wears its heart on its sleeve. 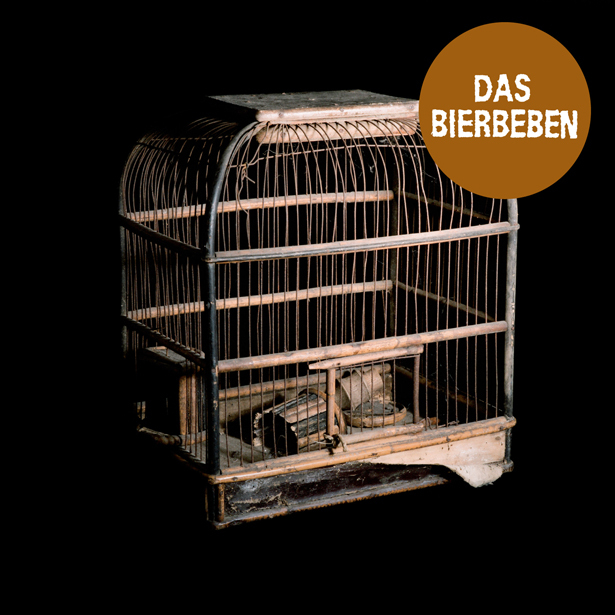 A simple, self-titled affair, “Das Bierbeben” marks the culmination of a steady development. Firmly ensconced in the context of pop history, the band churn out a deluge of faithful references, copy and recycle, mix and revive, cherish and celebrate the great protest movements of (German) pop music: protest folk, 70s, Ton Steine Scherben, German punk and Techno find themselves joined in (un)holy matrimony. And a dark, maudlin wedding it is, too: the subject shakes off its prolonged slumber to embark on a momentous journey into the abyss, into the realms of pain and beauty. Here, it forms alliances, flutters free as a bird and sets out to face the powers that be, ready to witness their epic failure. In this tour de force, the band not only reverts to its own stark imagery (the gong, everything falls down, darkness/light, day/night, delirium), but also the well-known protest top 10: "Wehr dich doch, Geld regiert, Delirium, Abschied, Gegenwart - Zukunft, Nebel, Nacht, Stein, Flut, Meer" (why don’t you fight back, money makes the world go round, delirium, the pain of parting, the present – the future, fog, night, rock, flood, the sea) – all of them spoken milestones and part of a resistance army (in the past and now again), milestones that lurch, fall, slide, speed, fly and never deign to stand at attention. A record in motion, a gentle glide, “Das Bierbeben” makes for easier listening that its predecessor, “Alles Fällt”. And if it should warrant a cover feature, it would probably appear in East Germany’s foremost music gazette: Melodie and Rhythmus. There is pop to be heard – and then some. The album’s second track with English lyrics, „Behind The Green Door“ as well as „Abschied“ (farewell) and „Wie Ein Vogel“ (like a bird) retrace the origins of the song: hooklines, chorus, sing-along segments, the joy of dreaming and letting go, heart-wrenching melodies. Spurred on by these traditional structures, Das Bierbeben tackle the German traditional “Hochzeit” by Franz Josef Degenhardt, after their “Alles Fällt” reworking and correction of our grandparents’ favourite, “Kein Schöner Land”. For “Hochzeit”, they pull out all the stops, couching apocalyptic lyrics in lullaby harmonies. A more explicit rendition of this pending apocalypse rears its head on “Nihilit” – here, a star comes crashing down, “days become night,” nobody sleeps and the waters rise. GONG! If Mike Oldfield had a hand in Das Bierbeben, he would weigh in with a nod of approval. Speaking of the devil: Das Bierbeben’s production has seen a major overhaul. Recorded, produced and tweaked to perfection in four different studios, the band swapped plug-ins for analogue synths and added live drums, guitars, marimbas, flutes and some other instruments within reach. With label boss Marco Haas (aka T.Raumschmiere) at the controls, the band’s sound has done a double take and now sounds clearer, stronger, more concise. Das Bierbeben is a project by the „Künstelrgruppe im Namen des Volkes”/artist group in the name of the people, produced by Thies Mynther and Jan Müller and engineered by Marco Haas. The band comprises Jan Müller (Tocotronic, Dirty Dishes), Julia Wilson (a former member of the Poptarts), Rasmus Engler (Herrenmagazin, Dirty Dishes, Gary) and new member Alexander Tsitsigias (Schrottgrenze, Saboteur, Station 17). Jessica Drosten left the band, with no hard feelings and in high spirits, after several pregnancies and other projects.